Can you Bring Alcohol, Cigarettes, or Marijuana on a Plane? What About Flying With Makeup & Deodorant? If you’re flying within, to or from, the U.S., there’s no avoiding it: you’ll have to contend with TSA — which is shorthand for U.S. airport security. Even if you’re already familiar with some of their basic post-9/11 rules and regulations — such as taking off your shoes before screening, or limiting liquids to no more than 3.4 oz — you may still have questions about what you can and can’t bring through security. Even after hundreds of trips, I still get caught off guard. In fact, I’m writing this from the aisle seat of a flight from Boston to Mexico City. Barely two hours ago, the TSA confiscated an 8oz can of pâté from my partner’s backpack. “All spreadables fall in the ‘liquids, gels, and aerosols’ category, ma’am,” the agent said. Maybe it’s just me, but it sounds gross to categorize pâté as any of those three, but now I know. To help you clear TSA quickly and with all of your items (spreadable foods included) in tact, this article will take you through (almost) everything you need to know. We’ll cover basic TSA rules and regulations, a list of common items people have questions about flying with, tips for packing, and ways to get through airport security faster. As if packing weren’t hard enough, the TSA also has a set of rules travelers must abide by when packing both carry on bags and checked luggage. These rules apply to all travelers — regardless of airline — since it’s TSA setting these rules, not Delta or United. Liquids, gels, and aerosols are allowed in your carry on, but only if they follow the 3-1-1 rule: 3.4oz (100 ml) per container, all in 1 quart-sized bag, 1 bag per passenger. Anything larger is allowed in a checked bag. (So, technically, I would have been able to travel with that pâté had it been smaller. And, actually, I had two 2oz bottles of gin that did pass through TSA because they were under 3.4oz. The confusing part about this rule is what qualifies as a liquid, gel, or aerosol. There are some obvious things, like body wash, hair spray, and water. But others, like peanut butter, yogurt, and creams are less obvious items that also fall in this category. To clear things up, we’ll get into specific items a little bit later on in the article. The TSA isn’t totally inhumane. Breast milk, formula, and juice are exempt from the 3-1-1 rule. Containers with breast milk, formula, and juice of more than 3.4oz are allowed on flights. Baby food is allowed “in reasonable quantities.” This exemption also applies to medications. Just declare them before your bag gets screened. Yeah, so, do I really need to tell you that you can’t bring a gun or weapon on a plane? Because you can’t bring a gun on a plane. For very obvious reasons. Also explosives, like fireworks (and anway, who on earth considers those a travel essential?) can’t go in your carry on or in your checked bag. While items like guns and knives are obvious no-nos, some others fall in a grey area with this rule. For example, a wine opener with a knife on it is not allowed, nor are e-lighters. Zippo lighters without fuel, however, are allowed in carry ons (but not checked luggage). Smokers and campers, rejoice. If you don’t have TSA pre-check and go through the normal TSA security line, you’ll have to make sure your liquids are in a clear plastic bag and take them out of your luggage to be screened. You will also need to remove your laptop and other large electronics from your carry-on and place them in a bin. Finally, remove your jacket and shoes for screening. Also note that individuals over the age of 70 are allowed to keep a light jacket on during screening. If you have TSA pre-check, keep those shoes and belts on and your laptops and liquids inside your bag. Don’t be that noob slowing down the fast line by taking off your shoes for funsies. Packing tip: Keep your electronics and liquids on the outside of your luggage and easy to access. 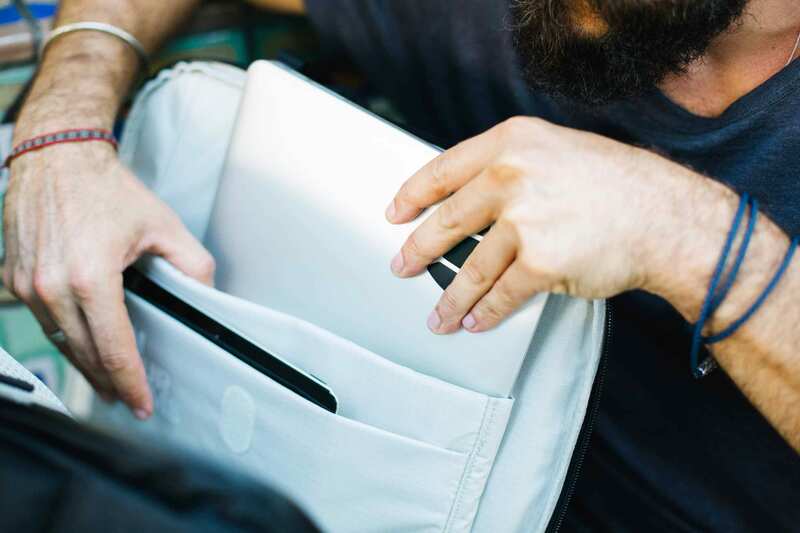 If you have a Tortuga backpack, there’s a dedicated sleeve for your laptop in the back, and additional pockets in the front that make pulling out your liquids and electronics quick and easy. Yes. If it’s solid food (sandwiches, chips, apples, bananas, etc.) you can bring it in your carry on. If it’s considered a liquid, gel, or aerosol (like yogurt, peanut butter, jam, and, uh, I guess cool-whip), you’ll have to keep it under 3.4oz. Again, the confusing part is what food falls in which category. Take cheese as an example: sure, you can go ahead and bring a 12oz hunk of that solid, Vermont cheddar on the plane with you. But if it’s a creamy California camembert, you’ll have to keep it snack size. For all you party people out there, let’s break this question down a bit. First, flying with alcohol. As long as you’re following the 3-1-1 liquid rule, yes, you can bring alcohol under 70% proof on a flight. “Although you are able to bring alcohol that is within the size guidelines through TSA, you ARE NOT, however allowed to consume it on a plane. Most major airlines don’t even let you consume alcohol brought at Duty Free places . It’s against policy. I’m a flight Attendant for are major airline and we are not allowed to let passengers consume any alcohol that is not bought on-board the aircraft. Then there’s the question of whether you can bring cigarettes on a plane. While you can’t smoke on a plane (and haven’t been allowed to since 2000), you are allowed to bring cigarettes in your carry on. E-cigarettes and vaping devices are allowed in carry ons, but not checked luggage. And finally, can you bring marijuana on a plane? 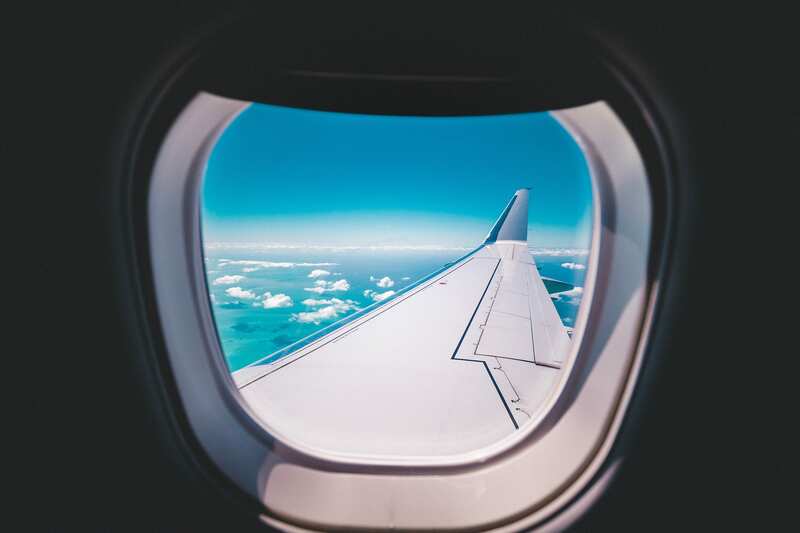 Even though marijuana and marijuana-based products (like CBD oil) are legal in some states, they aren’t federally legal and, therefore, are not allowed on flights. This applies to medical marijuana as well. Your toiletry bag is the part of your luggage TSA scrutinizes the most, so it’s natural that you’d have questions about makeup and deodorant. With the exception of powder, lipstick, and solid makeup, pretty much every other makeup item needs to abide by the 3.4oz rule — this includes mascara, liquid eyeliner, nail polish, perfume, hairspray, foundation and all of your creams and lotions. Deodorant is the same. You can bring solid deodorants of any size in your carry on, but sprays and liquids (looking at you, Axe lovers) will have to be travel-size for TSA to allow you to fly with it. Even if you’re following all of the rules, there’s still a chance that you may get pulled aside for an additional screening. While you should always allow yourself a little extra time in case this happens (about 10-20 minutes), packing your bag corretly can also be the difference between you breezing through security and getting your bag rifled through. Here are a few TSA-approved packing tips for you to follow while preparing your carry on bag for your next adventure. To make screening your bag easier for TSA, and avoid having your bag opened and totally unpacked, pack your bag in layers. The more organized your bag is, the easier it is for TSA to tell what’s in it and give it the green light. Packing cubes can help add additional organization to the inside of your luggage. If you don’t have TSA pre-check, you’ll need to be able to quickly and easily whip out all of your liquids. Keep them in one bag and, to follow regulations, make it a clear toiletry bag. If you don’t have TSA pre-check, you’ll want to quickly remove both of these items, and repack them once you’re through security. Even if you do have TSA pre-check, it’s still helpful in case your bag is selected for inspection, so they can find the potentially hazardous items quickly. Waiting in long security lines is tedious, but there are a couple of programs travelers can enroll in to cut down their security line wait time and make going through TSA screenings a lot less painful. The two main ones are TSA pre-check, and CLEAR. After nearly missing a flight at JFK while waiting in an hour-long security line several years ago, I finally caved and signed up for TSA pre-check. So far, it has been 100% worth the investment (note that TSA pre-check is included when you apply for Global Entry, and Global Entry is the same price). 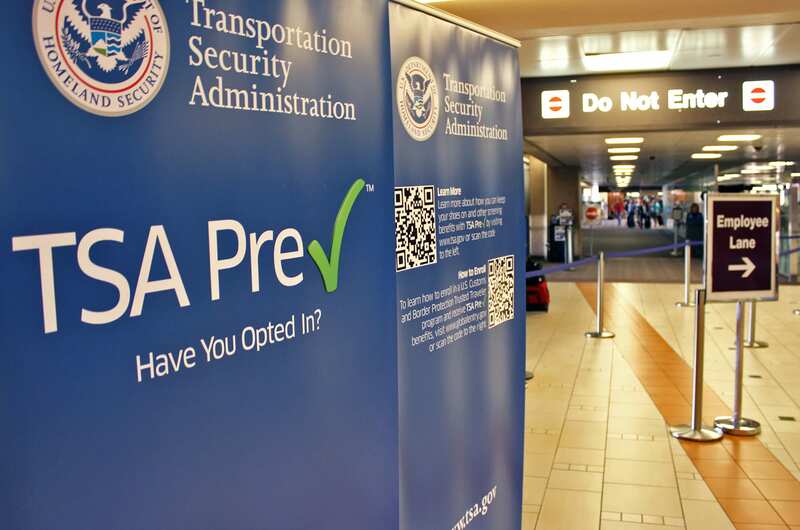 If you’re not already familiar, TSA pre-check allows travelers to go through a separate, dedicated security line at airports. 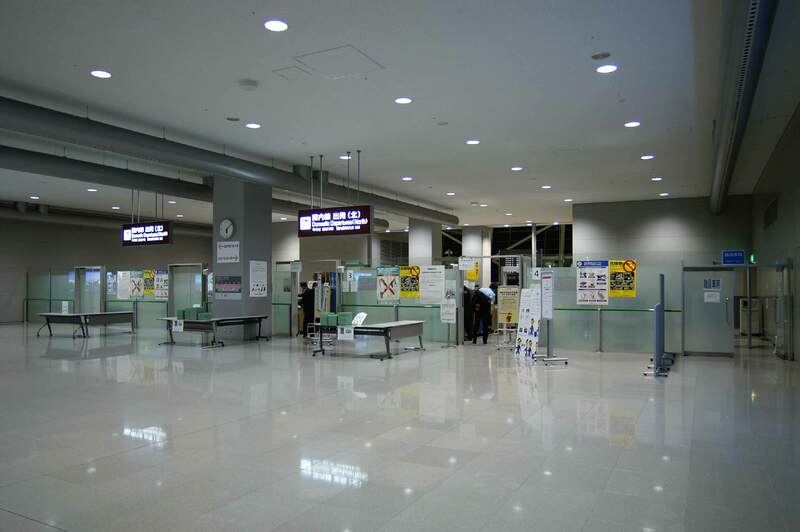 These lines are often (though not always) shorter, and screen passengers more quickly than regular lines — since passengers are not required to take items out of their bags or remove shoes. Not only do I save time, but also hassle, when going through security. I now regularly get through security in under 10 minutes, especially at my home airport, SFO. Similar to TSA pre-check, but at a much higher price point, CLEAR allows you to verify your identity at airports with a fingerprint or eye scan and clear security in mere seconds. It’s even quicker than TSA pre-check, according to my D.C.-based parents, who invested in a CLEAR membership over a year ago. Although fast, there’s a downside. It’s not available at all airports and, at the time of writing, is only available at 30 airports. I’d only invest in it if it’s available at your home airport.